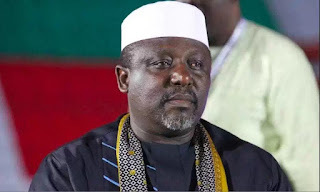 After calling out the Imo State governor, Rochas Okorocha, twice in ten months, I gave up. The governor has the whole of Imo as his duchy and he will do what he will do. So, what’s the point? If I’m now constrained to cry more than the bereaved people of Imo, it’s simply because their worsening misery is killing me. For two weeks, Okorocha held the state hostage to mark his 55th birthday anniversary. School children, whose parents are still being owed salaries of up to three months, were lined in the streets of Owerri to salute the governor. Mothers whose stalls in Ekeukwu market had been demolished by the state government in defiance of a court order and the parents of Somtochukwu who lost the 10-year-old boy during the violent eviction were expected to send glowing tributes to Okorocha at 55. State workers, who had been eating the life-size portraits of Okorocha since he would not pay them salaries, were offered yet more portraits and statues to eat to mark the governor’s 55th birthday. And to crown the insult, rogue politicians in the ruling All Progressives Congress organised a party at the stadium, aired on live TV, to tell us how the governor had made the sun stand still in the last six years of his administration. While the show was on, he complimented the fawning crowd from time to time with that trademark grin that tells the story of his suzerainty. Okorocha is killing Imo. I would have stayed out, but how can I? How can anyone with a conscience see what Okorocha is doing and look the other way? How can? He took his folly to a whole new level last week when he invited South African President, Jacob Zuma, to crown the activities marking his 55th birthday. But this is not about the South African president. It’s about his host, Okorocha, who thinks it’s all right to turn a blind eye on Zuma’s baggage and, worse still, insult the people of Imo by hosting his guest with public funds from which he also erected a Zuma statue. In Okorocha’s haste to acquire star power, he couldn’t even make a good statue of Zuma. He was out-conned. With Zuma in town, chaperoned by his cousin, former President Olusegun Obasanjo, Okorocha was immensely pleased about the exhibition of star power. But the outing, concealed from even the State House of Assembly and supervised by the governor’s private army, meant something more to Zuma: it was a welcome escape from his woes at home. As Zuma was boarding the plane to Nigeria, the Supreme Court of Appeal in his country ruled for the reinstatement of 783 charges of corruption and fraud against him. Zuma had been giving South African prosecutors a run-around over charges that he took bribes worth over $304,000 and was involved in racketeering, fraud and money laundering. This was apart from charges that he used $23 million of state money to refurbish his sprawling apartment in Nkandla – funds which the courts ruled that he must return. On top of all these, are charges that Zuma’s bosom business friends, the Guptas, had used their influence with him to capture the state. As Zuma was landing in Owerri and Okorocha was unveiling his statue, naming a road after him, and awarding him a chieftancy title, protests were going on in South Africa, calling for Zuma to resign because his government has been overwhelmed by corruption. He’s still in power but the office left him since. There is an elaborate spin that the visit is also to help strengthen cooperation between the Okorocha and Zuma Foundations; but that’s nonsense. Philanthropy could use better examples than two adults who rob Peter to pay Paul. Isn’t it amusing that since news of the Okorocha-Zuma project broke, not a few South Africans have been saying Okorocha is doing it to give Nigerians a pass for drugs in South Africa? That’s nonsense. Whatever Nigerians will do – good or bad – hopefully more good than bad – they will do without help from the Okorochas of this world. Okorocha and Zuma are on their own. Okorocha is killing Imo. It’s OK if he wishes to cultivate Zuma’s personal friendship. But he cannot pay N500 million or more from the state’s treasury to do so. With a governor like Okorocha, right-thinking people in the South-East must be wondering if the Imo State governor is the face of change that the ruling party prides itself on, unless it was meant to be a change for the worse. Is Zuma a friend, really? In two years under his watch as South African president, 116 Nigerians have been killed in that country, most of them victims of premeditated homicides. A good number of them are Igbos and at least one, Daniel Timothy, is from Umunuma Okohia, in Isiala Mbano Local Government of Imo State. As Okorocha unveiled Zuma’s statue and named a road in Owerri after him, I wondered how the parents of Timothy would feel whenever they see that statue or travel on that road. What was Timothy’s widow – and his surviving four children – thinking on hearing the news? True, Nigerians have not been the only targets of the rising wave of xenophobia in South Africa. But in the last two years, no other country has recorded a higher number of casualties than Nigeria. And this has happened in spite of repeated promises by Zuma’s government that it will ensure the safety of Nigerians. Did Okorocha bring up the X-word with Zuma or did he simply grin all the way in his peculiar Okorocha way? The ruling APC obviously does not think that Okorocha is a problem. He’s the party’s mascot in the South-East, a region where President Muhammadu Buhari is most unpopular. Okorocha’s continued shenanigans guarantee Buhari and his ruling party a rough road to any hope of recovery in the South-East, if it still matters to them. Whether it’s about a possible new life in the South-East or the pursuit of the APC’s anti-corruption agenda, Okorocha is killing whatever is left of his party’s image. Some will argue that it would be unfair to single him out among the governors. After all, in the race to the bottom, Yahaya Bello (Kogi), Abdulaziz Yari (Zamfara), and Ayo Fayose (Ekiti), are also doing their best to lead the pack. At this rate, however, it appears that the crown for hubris might be a straight fight between Bello and Okorocha. But are citizens really that helpless? In a region where women resisted unfair taxation by the colonial government in 1929, I’m at a loss why 88 years later and with far better educated, more enlightened and prosperous citizens, an Okorocha would take the people for a ride, grinning for good measure. My governor, my governor: your works are killing me.